Discussion in 'The Lounge' started by ALEXIS_DH, Aug 17, 2012.
so, i have not had a gaming console in way over a decade. today, i was browsing the local version of ebay (i have posted my car for sale).... and it appeared to me. $35 delivered to my office. am also made a bid on mario 2, 3, excite bike and punch out (all for $20). i have to wait for the seller´s confirmation to see if he delivers, or if i have to pick it up. how can one pass a deal this good? its gonna be a sweet weekend. The reddit/Ridemonkey assimilation is complete. I got an old NES when my mother in law cleaned out her basement. It was almost brand new in the box. I need to score some new games but it's pretty fun to break out once in a while and play duck hunt on a 55" LCD. That's an awesome find. I'm jealous. 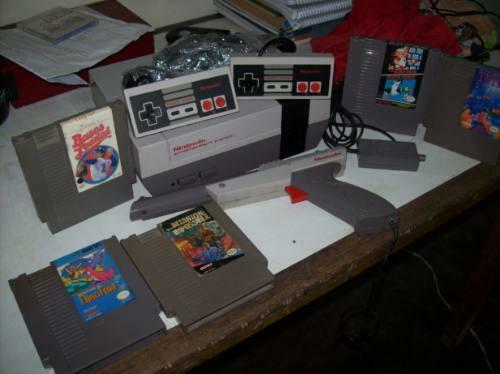 I still have my original NES that I got as a kid and it still works great. I have around 15 games including Skate Or Die 1 and Skate Or Die 2! nice work! I love those things! How did you get Duck Hunt to work on your plasma? Take joy in knowing that you will be the only human on earth playing NES with a $3,000 watch on. You just plug it in. No adapters needed. Still need to find a USB version of that utterly-indestructible controller, though. They were great for kids with anger-management issues. I bought the wii retro controllers and haven't used them once. Whoops! Wanted to download mega man 2 but I can't bring myself to spend $5 on what I can download a ROM for fer free. You might just be able to make one. I wired up an original xbox controller to a USB cable for use on my home confuser years ago. Worked for a couple games but was buggy as sh*t on others. YMMV. many years ago, when i had a computer with a lpt port, i ghetto rigged 2 SNES controller into a LPT port. 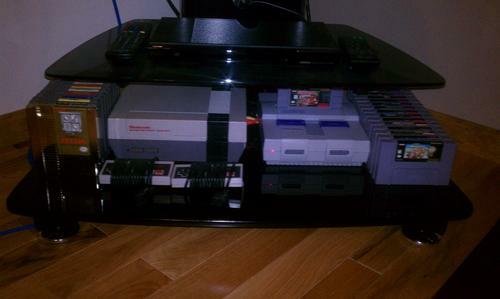 You aren't OG unless you have NES and SNES. Nice setup you've got there. I like the gold Zelda cartridge in front. I need to pick up a working SNES. I have a bunch of games, but the SNES died a few years back. As if it were a bum outside a restaurant. Easy, and with a smirk.